The hare is the subject of this tapestry from the work of 16th century German painter Albrecht Durer. Born in 1471, Durer became well known for his painting and printmaking in his early twenties. His works, including this one called "Young Hare" created in 1502 was created in his workshop in Nuremberg, flanked by his journeys to Italy before and after his 10 year return to his home town. From 1512, Maximilian I became Durer's major patron, and Durer's works, as one of the greatest artist of the Northern Renaissance focused on nature, such as this one of the hare, portraits and the human figure. 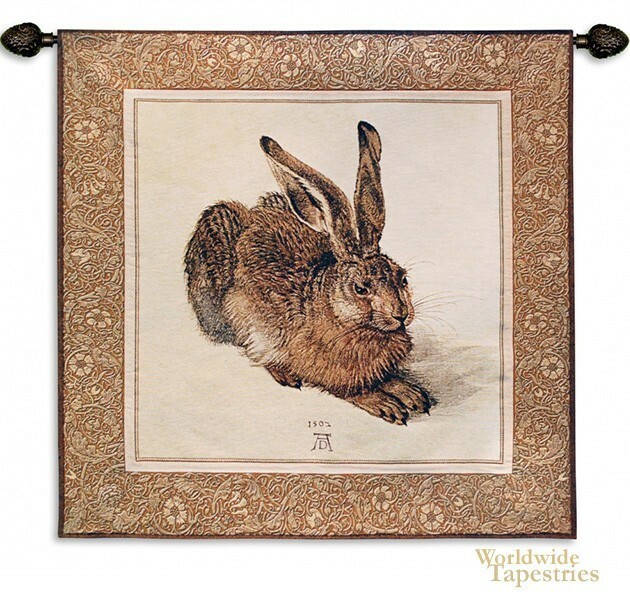 Durer Hare tapestry is backed with a lining and has a tunnel for easy hanging. Note: tapestry rods and tassels, where pictured, are not included in the price. Dimensions: W 45" x H 42"